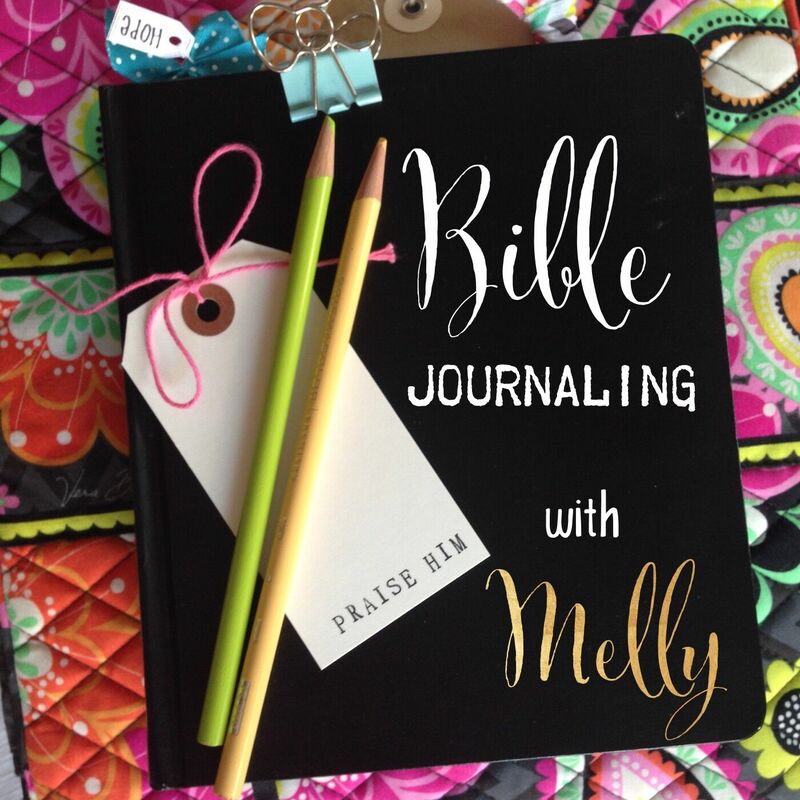 Silly Bee's Chickadees: Angel Party Turns Ten! 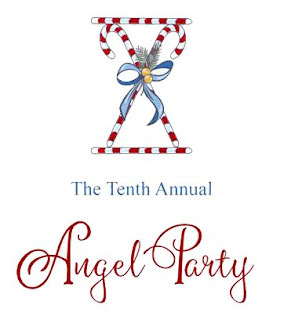 This is the first of two posts about the Angel Party, an annual shindig I throw with friends each year to celebrate the holidays and collect gifts for a local nonprofit. This year was the 10th Anniversary of the party! In honor of the momentous occasion, I wanted to add a few new goodies. Here they are in all their heavenly glory! I created this door sign with a pair of giant angel wings, some chipboard letters, gold glitter and beautimous gold ribbon. So simple and really gorgeous. I love how it turned out. I decided to use a white theme for the Angel Party this year. 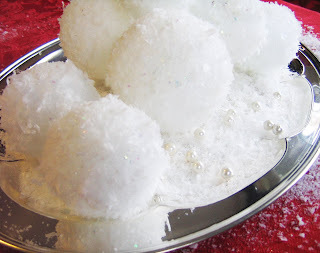 These snowball table decorations were super easy with Styrofoam balls in various sizes, craft glue, fake snow and a little glitter. I used a red table cloth and silver and white ceramic serving dishes. I also scattered some "pearls" that my friends, Christy and Jenny pulled off of some Christmas berry floral pics. 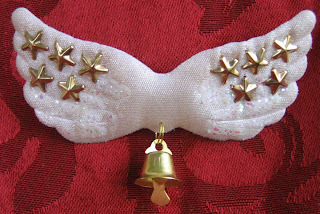 The first time a guest attends the Angel Party, she is given a pair of wings in the form of a cute little brooch. Every year she returns, she gets a little gold star to add to her wings. This year, everyone who attended also got a little gold bell in honor of the tenth anniversary. 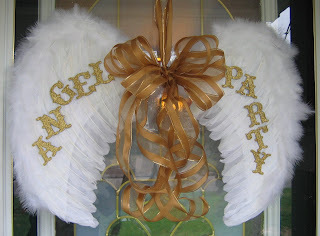 Another Angel Party tradition is the party favor that each angel leaves with at the end of the evening. Every year, I give everyone an angel ornament for their tree. Sometimes, the ornament has a spot to write "Angel Party" and the year on it. I bought these plaster ornaments and painted and glittered them myself. I wanted to keep a white theme this year, so I painted them in white and pearl paint and sprinkled pearl glitter on them. I think they are super cute! Tune in for more Angel Party fun! You are so talented. I didn't know you painted those ornaments! We do need to hang out. The kids also have this week off though so we would have to bring them along... any kid things you have been dying to go to? Wow lovely things,I enjoyed this blog so much.Yes you are very talented.Thanks for sharing.What is your first name? So i dont always have to right silly bee.lol Have a Happy New Year. What a great tradition. This is really neat! I am constantly amazed by your creativity and generosity. You should write a book.